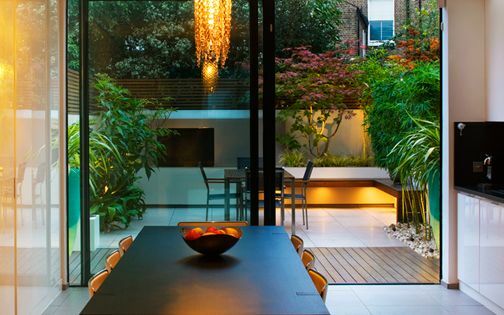 This small garden in Belgravia is shaded by buildings and walls, where buff sandstone continues the kitchen's flooring pattern to enhance fluidity, and reflect natural light. 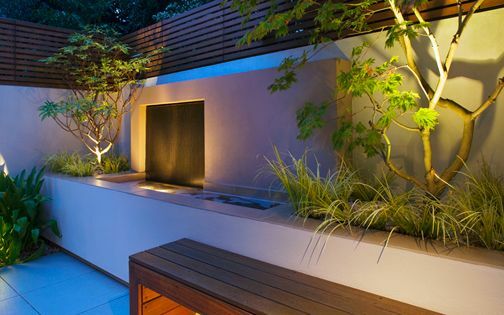 Floating raised beds provide comfortable sitting height, featuring an abundance of woodland foliage within a minimalist garden design layout. 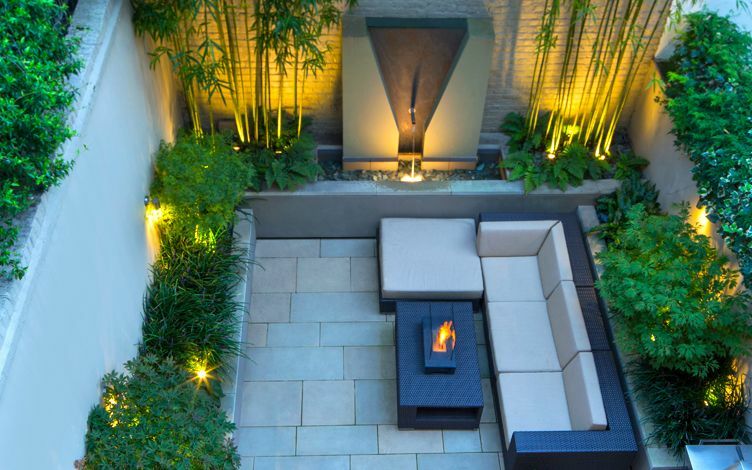 A substantial slate waterfall is centred along the main elevation, balancing a small garden space in scale and subtle detail. 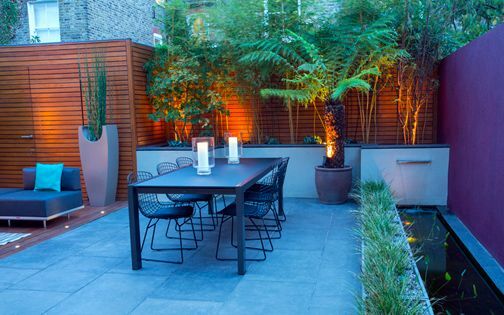 The sensitive renovation of this grand Belgravia home provided scope to revamp its small outdoor space and embrace a new design. 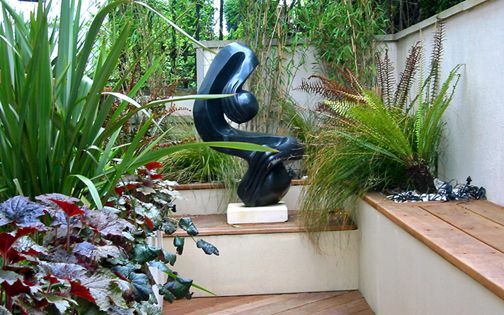 While working on a listed building, we conveyed renewed ambience with an innovative garden design, amid a classic framework, and although we often position our focal points asymmetrically, here, a voluminous water feature is centred along a tall back elevation – balancing the squared space and enhancing multiple vistas. 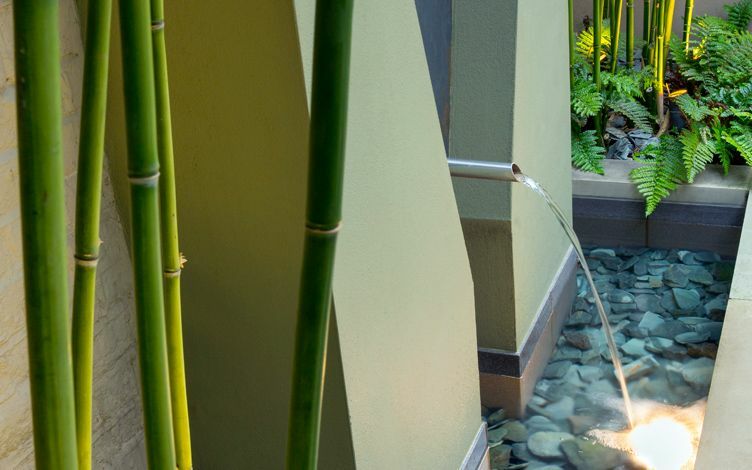 This sizeable structure forms a dynamic, eye-catching focal point, where multilayered scale effectively defines a greater sense of depth within a small garden, and reiterates the validity of bold design ideas for compact spaces. 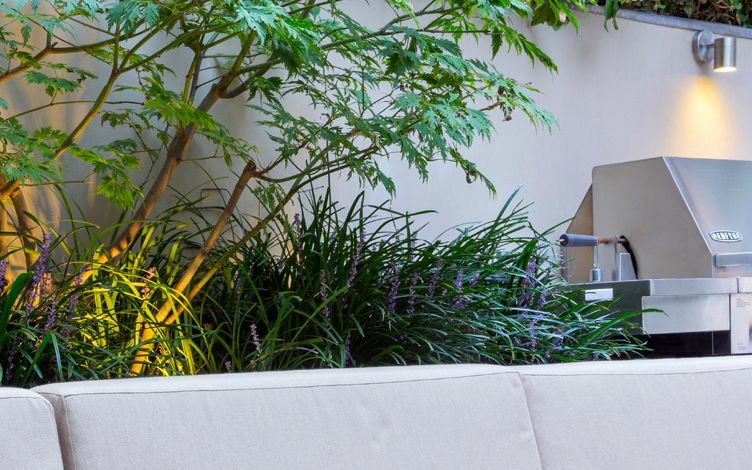 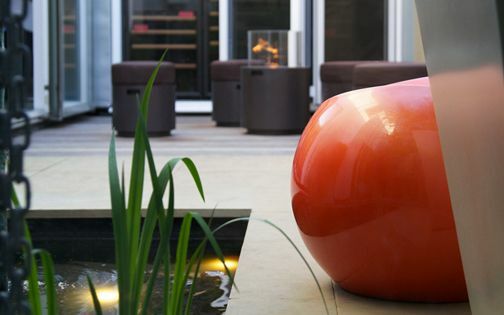 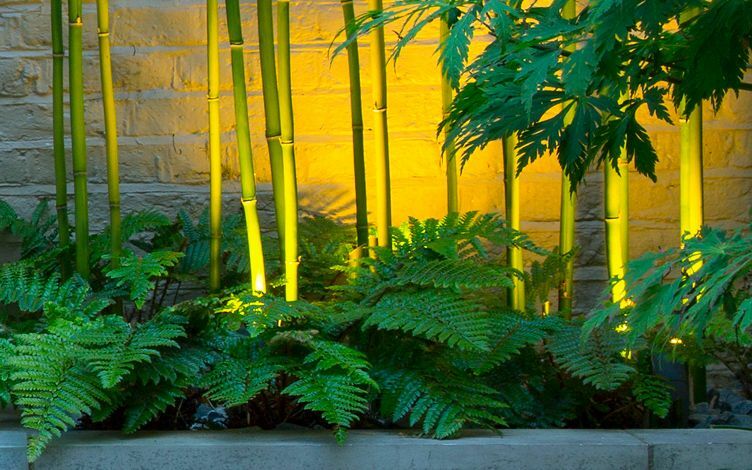 We practise a distinct, minimalist approach in our planting designs, utilising a concise architectural flora palette. 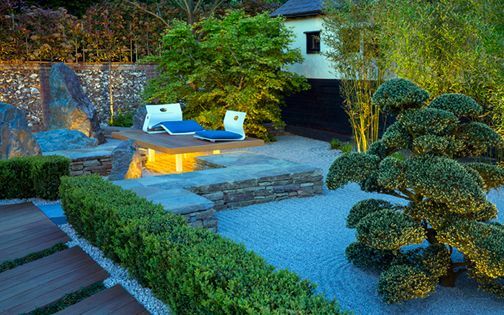 In this small garden, three Japanese maple species triangulate between its raised beds, underplanted with evergreen Ferns and Lilyturfs. 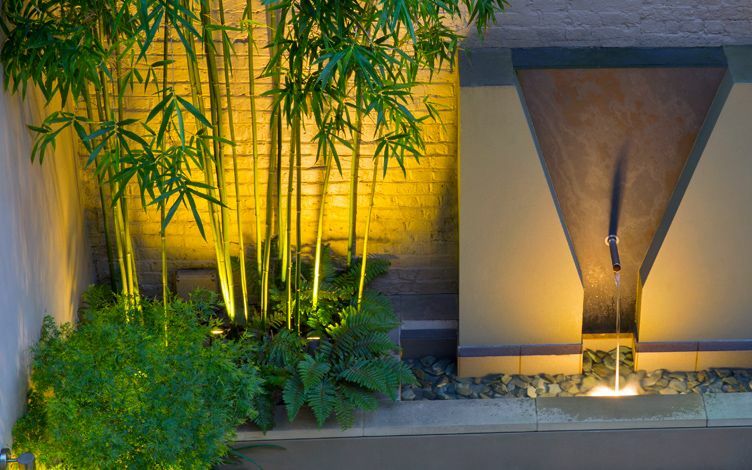 Flanking the water feature, two matching clumps of Narihira dake bamboo from Japan provide height and scale, where their graceful and upright stature portrays sculptural soulfulness. 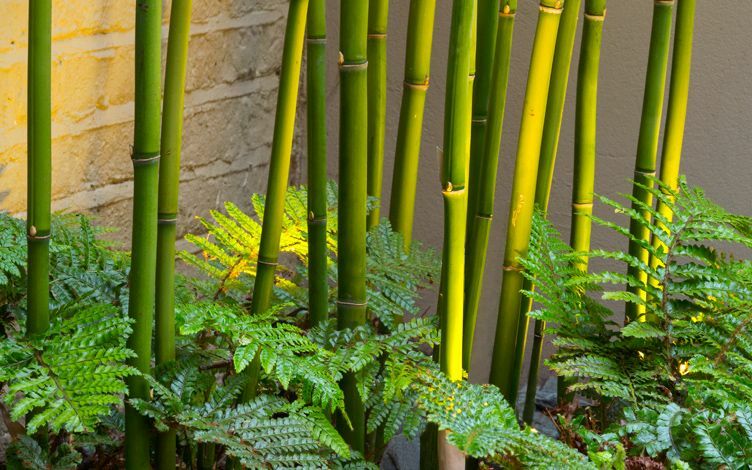 Thinning the Bamboo canes' lower segments produces silkiness contrasted with serrated Fern foliage, enhanced by low-key lighting design. 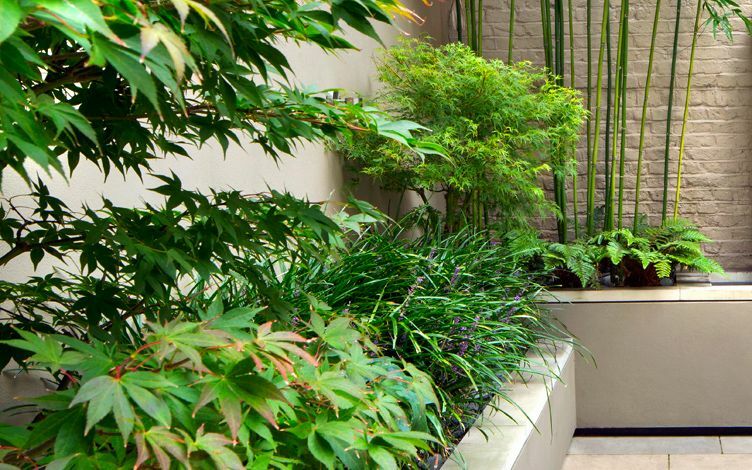 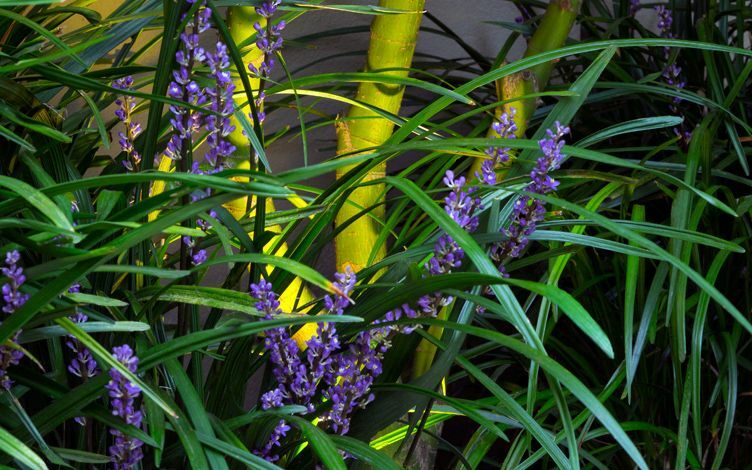 The Japanese woodland flora thrives in shade cast by tall Belgravia townhouses, and ultimately redefines this small garden's essence, where a selective palette of only half-dozen species sustains a minimal upkeep mindset. 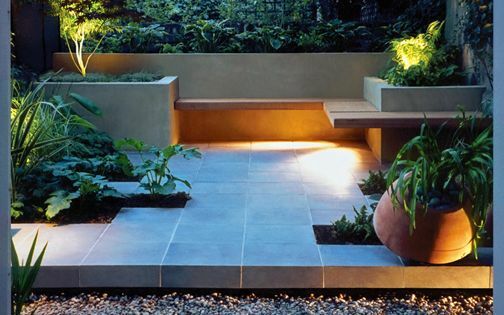 The kitchen stone floor was designed in a random layout, and we sought to replicate this pattern in our sandstone outline. 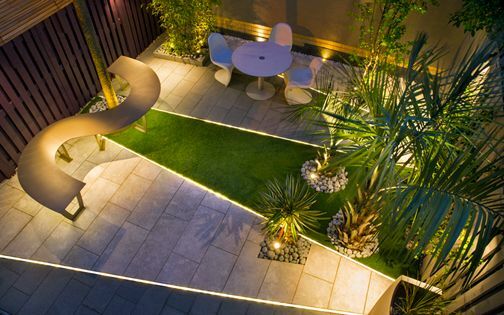 While the paving is fairly light when dry, rain highlights its colour variations, which range from buff through grey to blue. 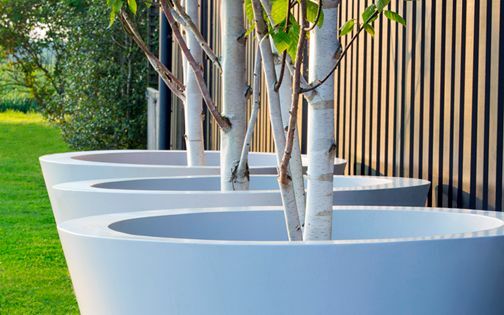 Given the bold scale of surrounding walls, we detailed the raised beds with recessed coping and floating plinths, where this creative technique infuses serene balance, augmented by a detail design which articulates a delicate interplay of shadows and light. 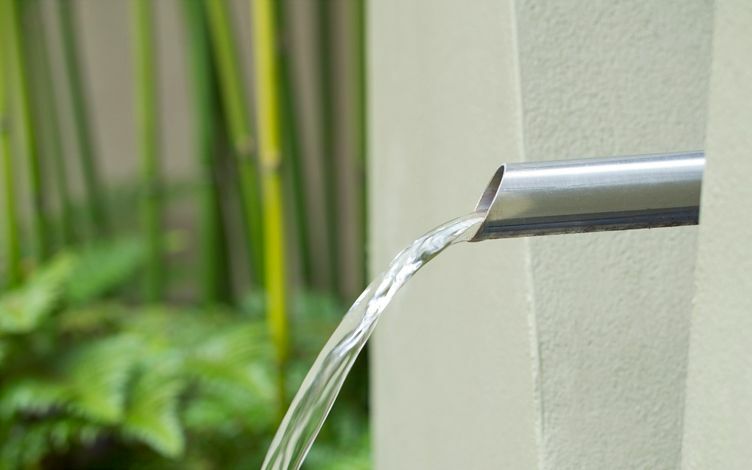 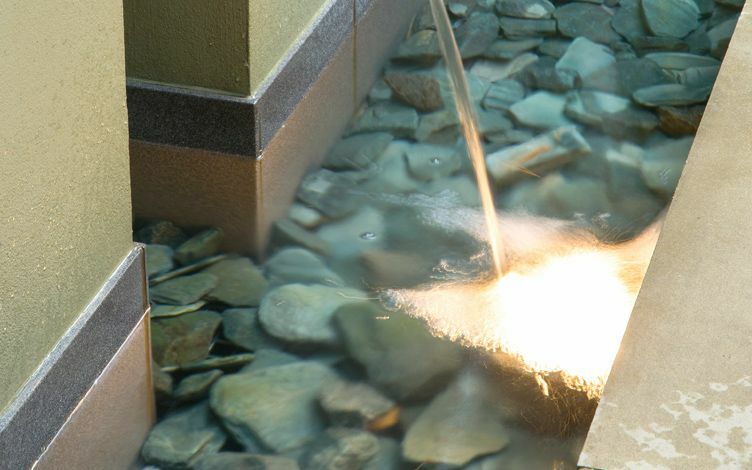 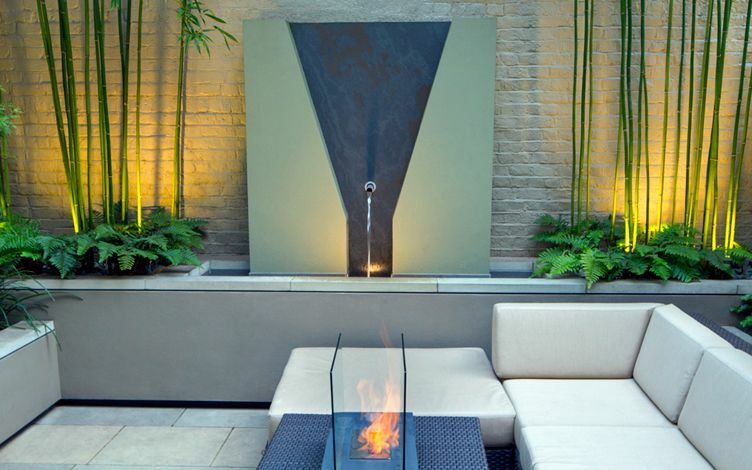 A small fire feature, added by our clients, generates a mellow Yin and yang ambience, aligned with the waterfall's stainless steel spout to produce vitalising essence in an intimate, well-integrated small garden design scheme. 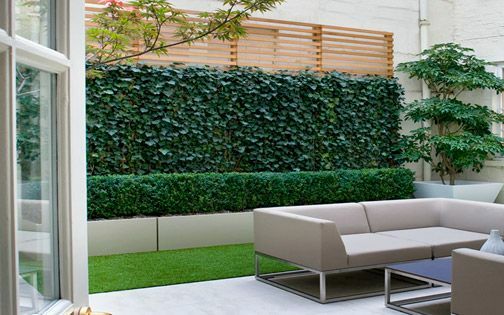 A soft spectrum of surface materials and colours delineates clear, compelling definition, where light-toned, rendered perimeter walls contrast the raised beds' deeper hues, increasing perspective towards this small garden's back elevation. 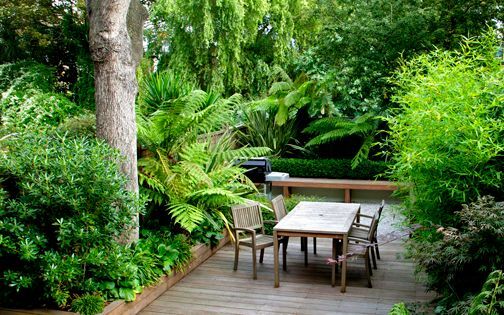 Developing design concepts when working in a Central London conservation area entails a meticulous and lengthy garden design process. 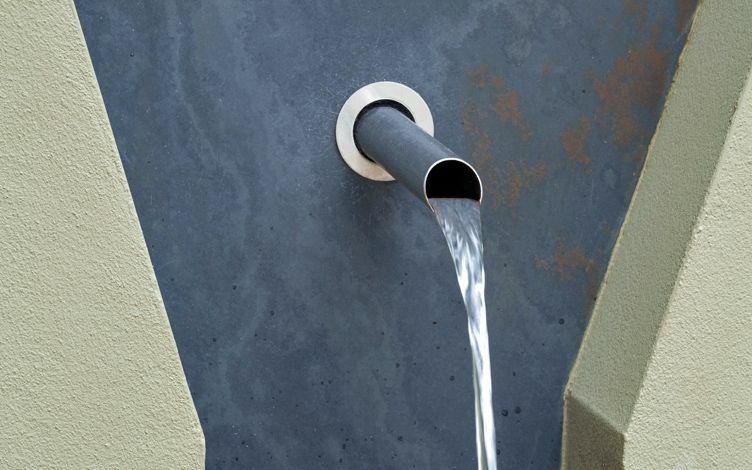 The location's traditional aspects were integrated into a minimalist layout with a sympathetic approach, where a restorative, contemporary design & build project rejuvenates authentic equestrian water trough elements as an inherent ingredient of local history. 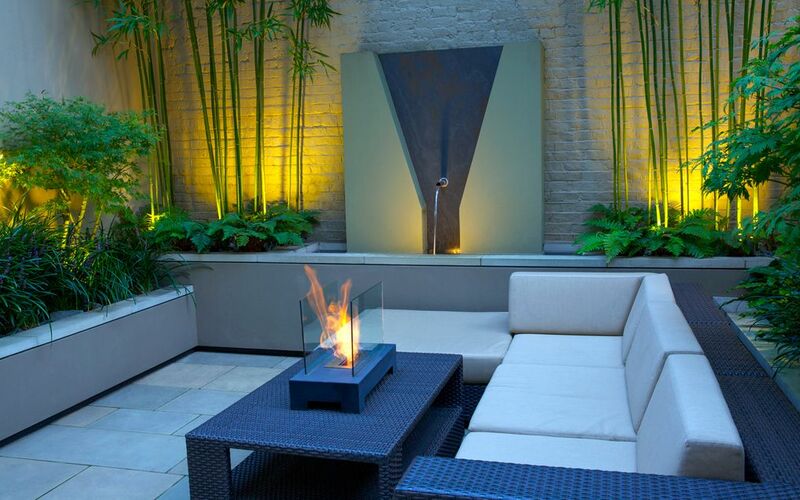 The small garden glows serenely around its aquatic centrepiece, while surrounding walls are softened amid soothing leafy qualities. 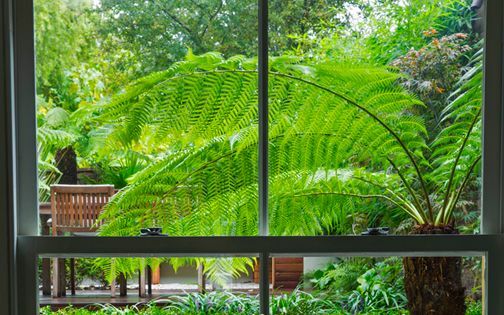 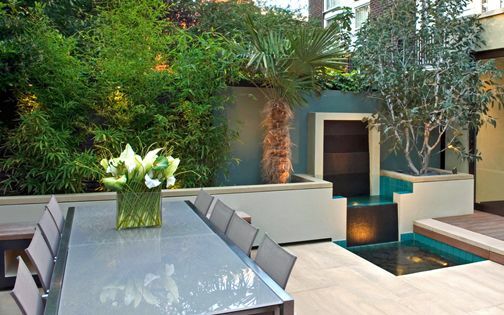 Enveloped by lush foliage, this intimate Belgravia patio is renewed into a secluded and modern small town courtyard garden.